Crispy quinoa covered in smooth dark chocolate! Unreal Dark Chocolate Crispy Quinoa Gems uniquely blend Fair Trade Certified vegan dark chocolate with the crunchy crisp of toasted quinoa for a delicious snacking combination that's going to become your new (guilt-free) addiction. Made with non-GMO project verified ingredients that are naturally colored with vegetable extracts and nothing artificial the taste may be UNREAL but we can assure you the ingredients are all-real and all good! 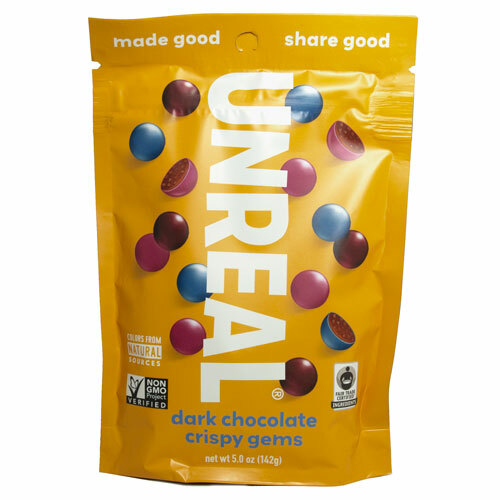 Unreal is on a mission to change the world one snack at a time! Ingredients: INGREDIENTS: dark chocolate (chocolate liquor*, sugar*, cocoa butter*, vanilla), organic cane sugar*, organic quinoa crisp, rice starch, colored with (beet juice, spirulina extract), organic tapioca syrup, gum acacia, carnauba wax, tapioca starch. Made in a facility that handles milk, peanuts, soy, tree nuts, wheat. *Fair Trade Certified by Fair Trade USA. 92% Fair Trade Certified Ingredients. From the package: Made in a facility that handles milk, peanuts, soy, tree nuts, wheat. Vegetarian info: Certified Vegan by Vegan Action. Each 5 oz bag contains about 162 gems and is 1.25" x 5.25" x 7.5".